Whether a room built with glass, wood and elegance is a conservatory or a sunroom is largely a matter of semantics, and, perhaps, a matter of cost. By any name and at any price, a room that lets the sun shine in and that invites people to gather is a welcome addition to a home. A relatively new Lancaster County firm has quickly established its niche in the upscale conservatory/sunroom market. In its Leola facility, Renaissance Conservatories builds custom rooms and then ships them and assembles them at homes nationwide. The firm, which builds between 25 and 30 conservatories a year, has done work from Lancaster County to California to New York City, and no two of its conservatories are identical. Every client has different circumstances and different desires. Mark Barocco, Renaissance president of sales and marketing, spends significant time listening to clients and designing the room that will please them. In 1997, Barocco co-founded Renaissance with Robert Sawyer, who now overseas the construction projects. Together they've built a company that will gross between $3 million and $4 million in 2001. 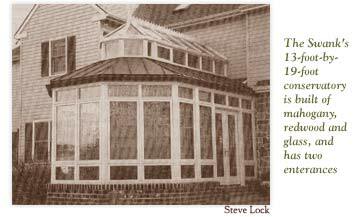 Barocco began Renaissance after spending 20 years as a distributor for sunrooms in Maryland and Virginia. When a Lancaster County firm that manufactured sunrooms fell on hard times, Barocco saw an opportunity to target the upscale conservatory market, a market dominated by British firms that capitalize on the perception that British is better. "Our main competition comes from England," Barocco said. "Some clients insist that their conservatories come from England." Other clients, especially in certain parts of the country, prefer American products. "Kentucky and Tennessee are a fertile area for us," Barocco said. "People there won't buy from England." In York County, Lori Ann Swank and her husband had been thinking for years of replacing a deck with a conservatory. When they saw an ad from Renaissance in Central PA magazine, they saw what they wanted and what they didn't want. "We didn't want a typical sunroom," she said. Instead, they wanted something that fit Barocco's definition of a conservatory-"A solarium with traditional design elements. Something you might see in 150-year-old home." The Swanks liked the idea that Renaissance was close and that the company's product was American-made. They also liked being able to custom design their room to fit their house. 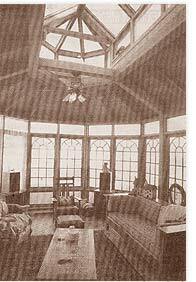 The Swanks chose a 13-foot-by-19-foot conservatory built of mahogany, redwood and glass. It has two entrances with sliding glass doors, and it's a popular part of the home. "We all love it. They do really fine detail work," said Lori Swank. An unexpected benefit of the building process was some free entertainment. "It's very well coordinated. It was fun to watch," Lori Swank said. When Barocco started Renaissance, he ventured for the first time into the role of being an owner and a boss, and he hired many former employees of the sunroom firm that had faltered. "It's all new to me-the manufacturing and the employees," he said. He is pleased with the quality of his employees. "We tap into the extensive depth of craftsmanship that's around us." One recent job in New York City presented a challenge. Clients wanted a conservatory breakfast room on their new Manhattan penthouse-on the 30th floor. Designing, manufacturing and assembling the room were the easy parts of the project. The real challenge was parking a truck. Barocco said that Renaisssance does a good deal of work in Manhattan, partly because no one else wants to work there. Transporting the large sections is a major part of any project, and Renaissance has its own delivery trucks that travel as far west as the Mississippi River. Beyond that, the firm uses contract carriers. "We don't use common carriers because the pieces are too big," Barocco said. The process of turning an idea into a room is not a quick, easy one. It begins with a client's idea of a room, and that idea starts a process that usually includes a request for literature, meeting with Barocco, the design of the room, the creation of drawings by Rick Herr, the building of the room in Leola, the shipping of the room and, finally the onsite construction. Barocco said the actual construction process usually lasts between one and two weeks. Renaissance has two construction crews, and they spend a lot of time on the road. "We make it worthwhile for them to travel," Barocco said. "We provide food, good lodging and lots of overtime." With all the work, transportation, and materials involved, these rooms don't come inexpensively. Prices average well over $100,000, Barocco said. With such prices, Barocco doesn't do mass advertising. Instead, he targets his efforts carefully. He advertises in publications such as Architectural Digest and Fine Gardening, and he charges $15 for his full-color, glossy brochure. He also targets architects instead of builders. "We have to skip the builder get to the buyer," he said. "This isn't a builder's idea of a sunroom." Still, Renaissance has good relationships with both builders and architects. Angelo Cristoforetti, owner of Cristoforetti Custom Builders in Collegeville, Montgomery County, has worked with Renaissance on several projects. "They build top-of-the-line conservatories," he said. Often, he and Barocco will visit a client together to sell a job. "Their work is terrific. The company has come a long way." Tucker Shields, an architect in Staunton, Va., worked with Renaissance when a client wanted to add a conservatory to a farmhouse that he was renovating. Shields designed a 450-square-foot conservatory to be a functional year-round living space. "They were very accommodating," Shields said of Renaissance. "Everything went well." To qualify potential buyers, Renaissance does not offer free estimates. Instead, Barocco charges design fees, which average between $1,200 to $2,400. "With design fees, the closure rate goes way up," he said. For people who can handle the $100,000 figure, the design fees are a minimal cost. Barocco said that he met with one potential client who had received a bid of $550,000 for an English conservatory. When Barocco said that he would do the same job for $450,000, the client didn't blink. Renaissance is growing, but Barocco is careful to avoid growing too quickly. He is, however, adding a new product, a line of garden windows that will be built to order with price tags of $3,000 to $10,000. Such a window might go into a kitchen to create a bright, roomy dining area or a small greenhouse. "We are looking to launch this product," he said. The company is manufacturing the windows and already has one on display at its facility.